Solar Wolf Energy is a fully-integrated nationwide solar panel installer with years of experience in construction planning, installment execution and energy and utility implementation. We engineer, permit, finance, install and warranty solar array systems for both commercial and residential applications. 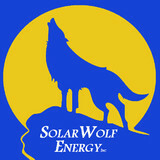 Focused on communication with the customer every step of the way, Solar Wolf Energy is dedicated to helping customers achieve optimal energy efficiency and financial independence. Harmony Energy Works - Your Trusted Solar Professionals At Harmony Energy Works, we do solar right with premium solar products and professional best practices workmanship. Our commitment to your long term investment means that we use only American-manufactured solar panels and best-of-class for all other balance of system components. This means that you will feel confident that your warranties will be backed up the entire time you own your system. We design, install and maintain every solar array we sell. We handle all the design, utility interconnection agreements, state rebates, and other grants, making the process as easy and seamless as possible for you. For commercial, residential, or government and municipal solar projects Harmony Energy Works should be your first and last call for solar in New Hampshire, Massachusetts, and Maine. Please contact us today at 603-926-3366. US SolarWorks is among the most experienced solar integrators in the region, supplying high quality, professional, full service solar system design and installation. Got Sun Go Solar is a full service solar provider for both residential and commercial applications with many years of solar servicing the southeast area of Massachusetts and Rhode Island. Brightstar Solar was founded and is solely owned by husband and wife Jon and Mona Reese in 2009. The Reeses manage all operations of the solar company and are particularly responsible for customer management, system design, and construction supervision. Both Jon (#032611-265) and Mona (#051112-156) have attained the highest level of certification in the solar industry, the designation NABCEP Certified PV Installation Professional. Mona is one of three women in New England who have earned full certification. We are a solar Installation company that strives to save our customers as much money as possible with Solar. We save the average homeowner 20 - 50% on their electric bill. You are helping the planet become independent from fossil fuels while putting money back in your pocket - A true win-win. We get our customers government funding to help them switch to solar energy with $0 out of pocket every day. Stop paying for other people to go solar and join the side that is getting paid to go solar - Call us today! Established in 2008, Second Generation Energy is a Solar Integrator based in Massachusetts and install around Mass, Rhode Island and Conneticut. We are owned and operated by a skilled team who are all passionate about the work we are doing. We believe that renewable energy combined with conservation measures will have the greatest impact on solving our energy problems. We have a deep commitment to developing and maintaining healthy, productive relationships and place utmost importance on customer service and satisfaction. We have a Customer Care Manager who ensures that there is clear communication through out the entire process and beyond. We know the value of happy customers, and strive for 100% satisfaction. Solar Source is a solar energy system design and installation contractor formed as a division of The Melanson Company, an 80-year-old roofing company known throughout New England for providing customers with the highest quality products and services. We are a family owned company in Marlborough, MA aimed at helping people save money while becoming more eco-friendly. Our innovative process of working from the ground up can help you save thousands while living comfortably. The renewable energy division of S+H Construction. Go to <a rel="nofollow" target="_blank" href="http://www.houzz.com/pro/sh-construction/sh-construction">http://www.houzz.com/pro/sh-construction/sh-construction</a> for more information. Rayah Solar is your premier provider of solar and renewable energy products. We have mastered the art of Turnkey and Worry Free Solar. This means a strong emphasis on customer service and making the entire process Worry Free. We show up, explain to you how we can put solar panels on your house for $0 Down, and shortly after, you have brand new solar panels on your home or business. For us, customer service is not just a by-word; it is built into our company name “Rayah,” which means “Friend!” We believe that treating each customer, as a friend is integral to giving you the customer experience you deserve. This experience also includes Quality! We only use brand-name, tier-one panels. To save you money, we buy factory direct, avoiding the cost the middle man. That’s how we can offer you the BMW of solar at the price of the Toyota. 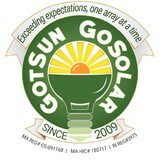 All of our customers can boast of the world’s best solar systems with an exceptional customer service experience. Since 1996 our professional team has been designing and installing economical, aesthetically pleasing and self-sustaining renewable energy systems for residential and commercial customers in Bozeman, Montana; Boulder, CO; and the Beverly /north Boston area of MA. Get your Free Site Assessment HERE. We use SunPower panels, the most powerful solar panels on the market. Our installations are top-quality. Our long-lasting warranty is proof of our confidence in our services. Our designs and installations are done by in-house engineers, licensed electricians and certified installers. We are deeply committed to helping our local – and broader – communities achieve energy independence by freeing us from the expense and environmental impact of fossil fuels. Let’s say you want a solar electric system for your home. An off-grid system basically consists of solar panels and battery banks. These battery banks store the sun’s energy so you can use electricity at night or on a cloudy day. This system is designed to keep household electricity running for about two or three cloudy days; longer cloudy periods require a backup generator. To install an off-grid system, you’ll want to hire a certified Massachusetts solar energy contractor. Along with off-grid solar, wind and hybrid energy systems that include batteries and backup generators, there are also grid-tied solar and wind operations. Grid-tied systems are attached to your Acton, MA utility company so if you produce more energy than you use, your meter goes down and you build up energy credits. Can you give me any information on Massachusetts solar rebate programs? 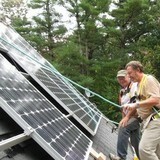 Find solar energy contractors in Acton, MA on Houzz. Search the Professionals section for Acton, MA solar energy contractors or browse Acton, MA photos of completed installations and look for the solar energy contractor’s contact information.